A few years ago, my husband and I relocated to Halifax, Nova Scotia, where we ended up spending almost a year. We didn't know anything about the Maritimes and quickly fell in love with the sea, the lighthouses, the victorian homes and... the trees! You see Nova Scotia is one (if not the one!) of the world's biggest producers of Christmas trees. That's where we first experienced the "u-pick Xmas tree" as they call it. The idea is to find a tree "farm" and wander among the trees in search for the perfect one. Once you do, get your saw and get working! We have been doing it every year since and will do it for as long as we can. Now I realize not everyone lives near a tree farm or can even get a real Christmas tree. Don't let it prevent you from creating family traditions. 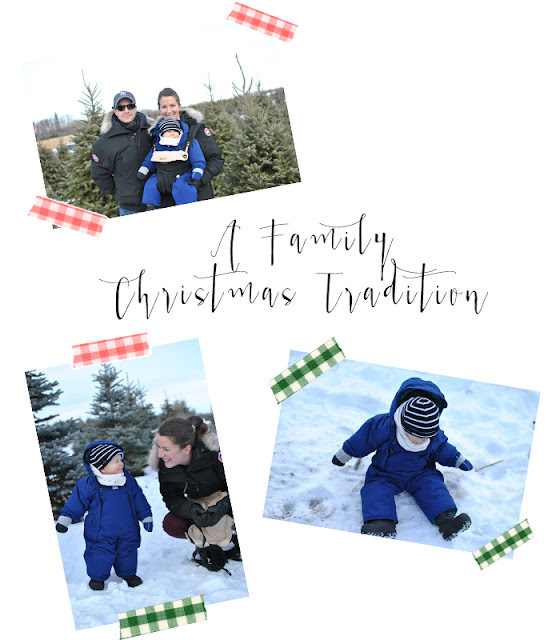 You can always make decorating the tree a special afternoon with Christmas music, hot cocoa and breakfast for dinner, or put on some matching pyjamas and take turns hanging ornaments while watching your favorite family Christmas movie, the list goes on!